So for the outfit that I have just posted the diary on, Denise needed new undies, too. 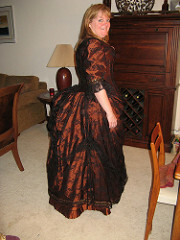 So I did for her a Grand Bustle(tv108) and a Petticoat(tv170). I went shopping for inexpensive fabrics to make these two fabric hogs out of, and hit the jackpot. The underbits that none but us girls ever see, is the only place where I ever go a bit wild. I made a bustle for my friend Delaenya last year out of black cotton with red dragons all over it, just because her man is into dragons. It makes me giggle. So while I was not as “crazy” with Denise’s fabrics, they are still very cute. 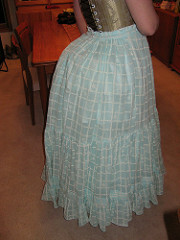 I made the bustle out of a printed stripe in leaf green. It is a fairly heavy drapery fabric, but it was $2 a yard. Her bustle is heavy, but it will probably outlive us all. Her petticoat is then a really pretty mint gauze with a white print all over it like window panes, and there are cute little designs like baskets of flowers interspersed through the squares. She needs a new corset after all her working out, and I think I will make it out of the green stripe. I am really quite pleased, and I cannot wait to see her in everything. Right now I have my own petti and bustle pinned precariously to my padded dressform. It is very amusing, but serviceable. And on to the ball gown. I did not do any sketches for this gown. I knew exactly what I wanted to do when She handed me yards and yards of copper colored silk, and black lace. Overlay!! Here is the gown that I have pics of that I used as inspiration. I just love the idea of simple elegance. You cannot do better than the beauty of lace over silk. I wanted this to be a very late bustle gown; just before the bustle fell. I used tv290 for the skirts. This lace had a great scalloped edge that I wanted to use so I mounted it directly to the plain silk skirt at the waist band. I will point out here that lace grows, so the side bustling is a fix to the fact that it grew…a lot, after I had already assembled it. Oh well. It is still pretty, and I like the look of the drape at the sides. I pinned them up with a glass button, and a spray of bead fringe from a previous project that were perfect colors. 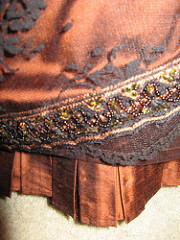 Here is a detail picture of the beaded trim on the overskirt and underskirt. For the bodice I combined an 1890’s and an 1880’s pattern. Why, I don’t know. As an after thought I should just have stayed with the bustled one, but oh well. It isn’t as much fun unless I make more work for myself. The bodice only has a little trim on the sleeves. I can’t wait to see her dance in it and it should photograph well.